At Dental Implants Center in NYC a single tooth implant can be inserted into your jawbone and then immediately fitted with a new replacement bridge. We can replace missing teeth In one hour using Teeth in an Hour Procedure. Dr. Rahmani is a leading, top dental implant specialist in New York and one of few implant dentists in NY region to offer newest latest procedures and most advanced dental implants in NYC. Dr. Rahmani of NYC Dental Implants Center is located on Upper East Side, Manhattan. Material: We use only the best quality medical grade titanium or titanium alloy tooth implants from Straumann, headquartered in Basel, Switzerland. It’s the largest and most advanced dental implant company in the world. Technology: Microscope-assisted precision implants dentistry used to enhance a dental implant specialist vision to unprecedented levels. It’s used for polishing and finishing teeth margins and for contouring teeth and teeth implants. Using teeth in a day procedure. Read more about your best options if you are Missing Multiple Teeth. A bridge is a popular option but does mean cutting down the healthy teeth either side of the gap. This is to fabricate a three unit bridge that consists of two crowns on the healthy teeth and a pontic or replacement tooth in between them. It is a strong and stable restoration but is far from perfect as the risk of tooth decay and infection to the crowned teeth is increased and the pontic tooth will do nothing to help prevent bone loss. A Maryland bridge may also be called a sticky bridge as it consists of two “wings” that are cemented or bonded onto the back surfaces of the teeth adjacent to the gap so they cannot be seen. These wings are attached to the pontic or replacement tooth. The advantage of this type of bridge is that very little preparation is required to the adjacent teeth, but it is only generally suitable for front teeth as Maryland bridges are not very strong and can often pop off the adjacent teeth and will need to be re-cemented back in place by your dentist. Flippers are one tooth dentures and tend to be a temporary measure as they are not very stable or comfortable to wear. They are generally used immediately after a tooth has been removed and while the area heals. A dental implant can be a great solution for replacing a single tooth. As a self-supporting structure it will help preserve the jawbone, does not require healthy teeth to be modified in any way and it can be more cost-effective in the longer term as renewing a single crown will be cheaper than renewing a three unit bridge. Usually after a single implant is placed it will be covered up and left to heal but it may be possible to place a temporary tooth on top of the implant in a process called teeth in an hour. You will leave with a brand-new temporary tooth attached to your new implant. This is purely for cosmetic purposes and will not come into contact with your opposing teeth as it is important not to load or place pressure on implants that are still healing. The temporary tooth is replaced with a new, more permanent crown after your dental implant has fully integrated with your jawbone. 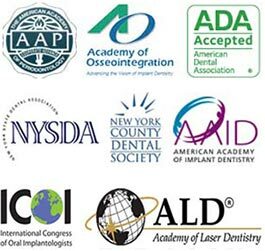 Do you have any questions about solutions for replacing a single tooth in NYC? Would you like to schedule an appointment with a best rated dental implants specialist in New York, Dr. Rahmani of Dental Implants Center NYC, please contact our office for consultation with top NYC dentist.